Identification: This species has a translucent-white body. The cerata have black-brown cores with white tips tinged with blue and cream. Orange lines run up each ceras. The cephalic tentacles have cream tips and there are distinctive orange bands running from the cephalic tentacles to the foot corners and the center of the head. Each line running to a foot corner branches with one branch extending down the side of body beneath the cerata. The rhinophores have cream tips and orange medial bands. Distribution: Oahu: widely distributed in the Western Pacific and Indian Ocean. 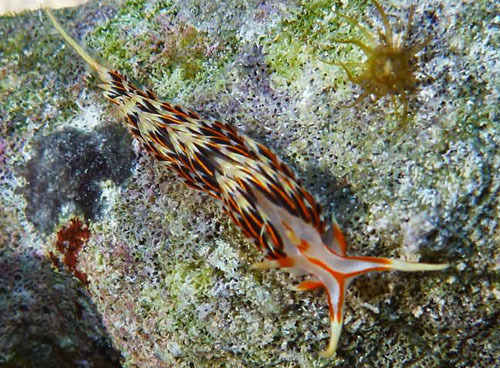 Taxonomic notes: Caloria militaris was first reported in Hawaii by Brian Nedved from Ford Island, Pearl Harbor, Oahu on Aug. 20, 2013. However, he believes he has seen it at his study site since at least the year 2000. (Note 2) It's listed in some sources as Phidiana militaris. The animals listed as Caloria militaris in Kay, 1979, Gosliner, 1980, Bertsch & Johnson, 1981 and Kay & Schoenberg-Dole, 1991 are Caloria indica and/or Caloria sp. #3. Photo: Kaho Tisthammer and Narrisa Spies: 22 mm: found by Brian Nedved; Ford Island, Pearl Harbor, Oahu; Aug. 20, 2013. Note 1: Kaho Tisthammer reported that it fed readily on the hydroid Pennaria disticha while in a flow tank at Kewalo Marine Laboratory. Note 2: Perhaps, it could be an introduced species (considering the harbor location of the Hawaiian animals and it's disjunct distribution)?